A long while back I mentioned that I picked up some battemats from Hotz Mats and wasn’t that impressed with them. 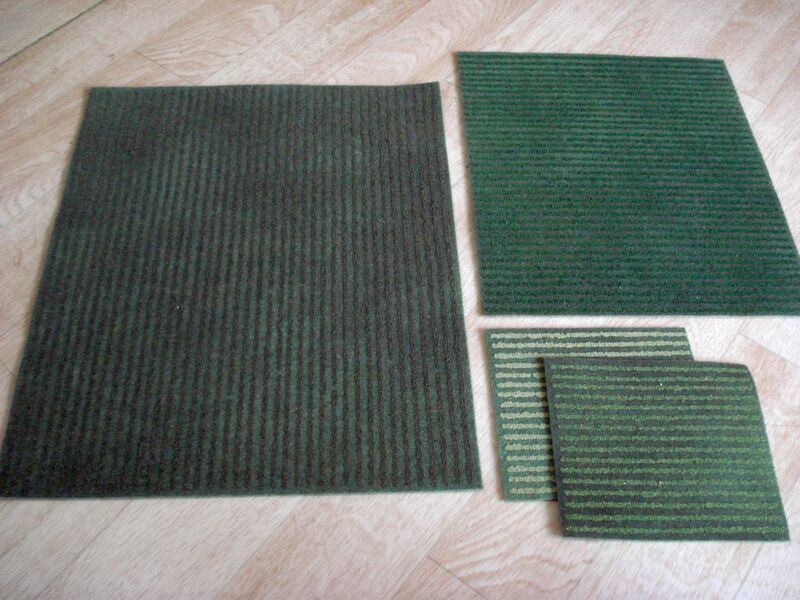 At the same time I made my order, I decided to pick up some flocked felt field sets from the same company. Despite me not being keen on the treated felt mats, I gotta say that I do like the flocked fields they offer. I bought 2 sets of the 20-30mm range felt fields. The fields vary in sizes and colors that look pretty good for that scale. Seems they offer smaller scale mats for 6-15mm. The pics I have here are of 1/72 scale Germans. It does seem that smaller models would look a little off with the larger scale mats. The felt fields are durable though and the flock is tightly adhered to the material. Mind you I keep them stored relatively flat tucked in a box of other terrain, so if tightly rolled up I’m not sure how they would hold up. But I have to say they’ve been through some heat and humidity and still look nice. Through normal gaming wear and tear you’d likely have some fields that would last for years. 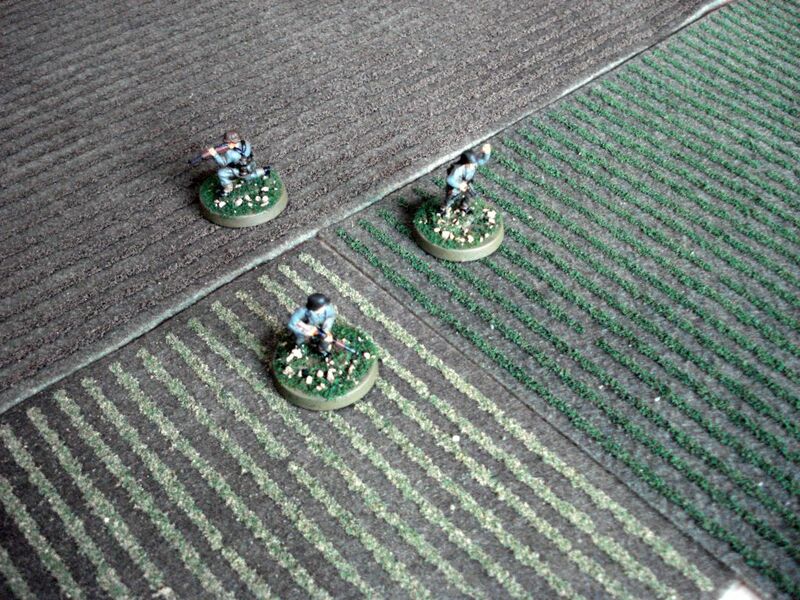 The felt fields range in size having one large section, 2 smaller fields (a little over 6″ long), and a mid-sized field. A good mix for a set which looks nice. 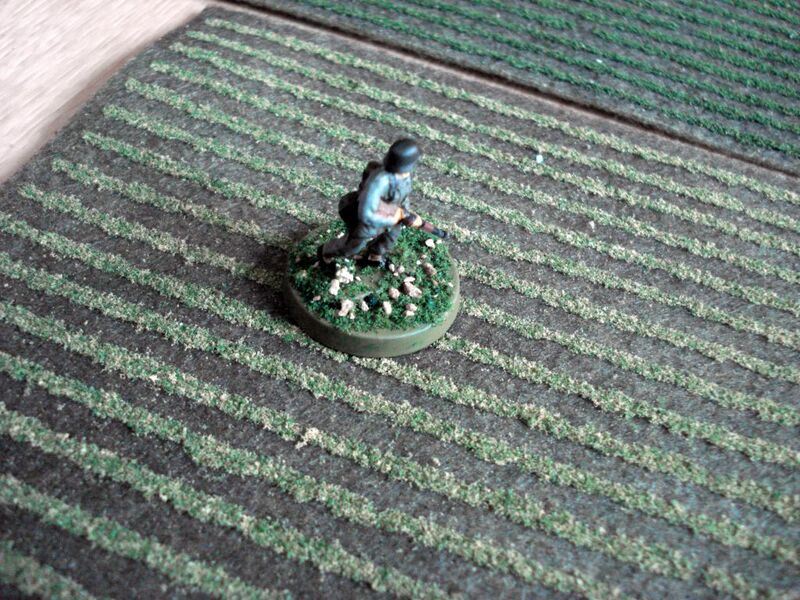 Throw in some small stone walls or bocage and you’d have a nice bit of rough terrain or light cover for your table. If looking to get some rural terrain and not too keen on modeling your own, they are a good option and worth picking up a set or two.